Memory Tips, Competition Updates, Etc. I was recently interviewed by board-certified pediatrician Dr. Steve Silvestro on his podcast: The Child Repair Guide where I shared tips on how to improve your child's (and your own) memory. It was a fun conversation where I also shared the story about my own memory-improvement journey. 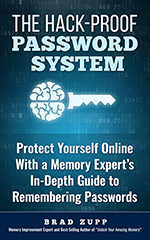 My book (The Hack-Proof Password System: Protect Yourself Online With a Memory Expert's In-Depth Guide to Remembering Passwords) is available at a perfect time. Just in the last few days there have been several reports of systems being hacked and people being asked to change their passwords immediately. This is obviously important for the site which has been hacked, but even more important because of the number of people who still use the same password for more than one website. This is so dangerous! In one report I saw this morning, a college's website was hacked and student user names and passwords were vulnerable. If students used the same password for his Amazon account, or her bank account, the hacker could easily gain access to those accounts using the stolen user name and password combination. In my book, I discuss this further, and recommend that people use a different password for every single website. It's entirely possible to do this by using any of the three methods I guide readers through in the book. Pat Helmers, sales guru extraordinaire, trainer, and podcast host, interviewed me recently about using memory to improve sales. We also discussed my new book, The Hack-Proof Password System. If sales are any part of your business, definitely check out Pat's podcast for weekly advice from him and other experts in business, marketing, and sales. Last week I had the great pleasure of begin interviewed by Anthony Metivier: podcast host, professor, author, and memory expert. We had a wide-ranging discussion about cyber security, passwords, learning, life-hacking, and more. We also dove deeply into memory improvement, how to remember better, memory palaces, and tips for remembering passwords. This is well worth a listen! Listen on his website or subscribe to his podcast for even other great interviews. I'm proud of how well it turned out. In it, I guide you through why it's so hard to remember passwords, how essential it is, and - most importantly - how to do it. I make the process easy and even fun with exercises that gradually develop your memory and creativity. You practice creating passwords to made-up websites like one for the Statue of Liberty, "Loud! ", "SuperCheapo" and others so you get a real feel for how easy it is. "I just use the same password over and over. How bad can it be?" Bad. Very, very bad. Imagine the headache from your social media account getting hijacked, or your email account spamming everyone in your contact list and infecting them as well. Bad things happen to those who reuse their passwords on multiple websites! "I just use a password management program." Oh, like the one that was recently successfully hacked? Or the other big one, that has been successfully hacked twice now? Your mind is the ultimate, unhackable (is that a word?) place to store your passwords. Use it! Yes, you can. Really. It's so much easier than you might think. While you're going through the exercises, you're also improving your memory for other parts of your life. Frequently misplace items? Forget the names of people? Wonder why you walked into the room? Don't remember things people tell you? Learning how to remember passwords will help you remember better in other parts of your life. "Why isn't this just a blog post? How can it be a full book?" An explanation of phishing, spear-phishing, two-factor authentication, and more. Click here to check it out on Amazon. There's a four question quiz to see if it's perfect for you. Then download it, enjoy it, give your mind a little (easy) workout. The powerful yet easy-to-learn techniques in the book will save you time, money, and frustration while protecting your privacy and making you secure. About a year ago I was on this podcast, and it looks like I never posted about it. I'm about to be on it again, so if you want to hear us twice, listen here and then again later this week!. I have been interviewed on Anthony Metivier's podcast Magnetic Memory Method. Where we talked about how anyone can improve their memory at any age. You can click here to listen and download or view the full transcript. I'm at it again! I'll be attempting to set a new world record on Pi Day, Tuesday 3/14, 2017. I'll attempt to break a record that has been called “The Everest of Memorization Tests.” It involves knowing not only the first 10,000 digits of Pi in five-digit segments: 3. 14159 26535 8979… but also being able to instantly identify any of the segments. Judges will give me 50 random segments and must be able to correctly recall the five digits both before and after every given segment. Watch the short video for a good visual explanation. Pi is the ratio of a circle’s circumference to its diameter, approximated as 3.14159, and has an infinite number of digits with no apparent pattern. The attempt will be held starting at 10am in Saratoga Springs, at 2 Union Avenue, Room 126, hosted by the Academy for Lifelong Learning and Empire College. Limited seating is available for spectators, but all are welcome to watch via Facebook Live via my page: https://www.facebook.com/brad.zupp. After the record attempt, I'll answer questions and offer memory tips. Please watch online on Tuesday - 10am Eastern - or catch the video of it that I'll post later. Whether you watch or not, please send warm thoughts my way during that time (and before as I train). This is by far the hardest memory feat I've ever attempted. I can easily memorize 10,000 digits - that only took about 11 hours. But to instantly place a five-digit segment out of the 2,000 total segments, then be able to know which five digits come before and after has proven very difficult to consistently accomplish in training. "The Everest of Memorization Tests"
You know you're in trouble when step 1 is "Memorize the first 10,000 digits of Pi: forwards, backwards, and out of order." That's what I've spent the last few weeks doing. Or, as my wonderful wife Beth said, "You realize that attempting to do that in only a few weeks is insane, right?" Yes dear...but what a challenge. Several weeks ago my friend Nelson Dellis, a fellow memory athlete, suggested we not only both attempt to break a world record in memory, but we do it against each other - to encourage each other and compete to see who could break the record by the most (if it was even possible to break the record). Making it trickier: he wanted to do it on September 21st, World Alzheimer's day, to bring awareness to the disease and educate people about it. We also are working to help scientists who are researching memory in order to eventually find a cure. Like a good friend (and an idiot), I said yes. Who cares that I'd have to fly to San Diego right after doing a big keynote address Tuesday morning in Philadelphia? No problem. The challenge: memorize the first 10,000 digits of Pi in 5-digit segments. For the record, judges will call out random 5-digit segments from anywhere in the first 10,000 digits, always from different thousands. In other words, the first segment may come from the 6,000-7,000 bunch, the second segment from the 1,000-2,000 bunch, etc. We will have to know Pi well enough that we can tell the judge the five digit segment prior and following the one they've given us. Randomly, no hints, no context. I memorize using pictures and storing the information in a series of locations (the rooms in my house, my town, nearby towns, etc.) The way it works out, it's 2,000 pictures. Each picture contains the five digits of a segment. Imagine someone giving you 2,000 pictures you've never seen before, in order from 1-2,000. Your mission, should you choose to accept it, is to memorize those pictures well enough that you know the order perfectly, even out of context. Making it more troublesome: imagine some of those pictures are really, really similar. For example, a lion tamer sledding down a hill and running over a bunny, and Joey from friends sledding down another hill, running over another bunny. AND a soldier sledding down another hill running over a bunny. And Joey from friends sledding down yet a different hill running over a clown (sorry, Barry Lubin/Grandma!). I wasted time trying to work out a new system for memorizing this much data, eventually throwing it out when it became apparent that the new system would take too long to develop. I was cruising along pretty well, memorizing 1,000 and reviewing every other day, when we had first a small family emergency, then a huge family emergency where I was unable to memorize for many days. Family definitely comes first, and thankfully the situation has worked itself out and ended well (whew!). But it set me back by almost two weeks. Now I'm sitting in the airport, big gig done, ready to fly to California, and hoping that the past week of cramming has been enough. My last Pi session with my wife a few days ago was depressing. I remembered many in a row, perfectly and quickly, then would hear a segment and have no idea...it was like I had never even thought of that picture before. I'd ask her to give me clues, the segments before and after, and even that wouldn't help. I figure out of the 2,000 pictures, I know 1,800-1,850 really well. That leaves way too many that I don't know well enough. On my drive to my presentation yesterday, I spent five hours listening to the numbers read out, hoping that would help. Now I have a 9 hour trip to San Diego to continue cramming! Nap your way to a better memory? Sleep is hugely important to a better memory. When someone complains to me that they have a horrible memory, it's one of my first questions: "How much sleep are you getting?" Most of us don't have the luxury of a daily or even occasional nap, but napping may be a valid way to catch up on your sleep and improve your memory. A new study from the University of California-Riverside, studied the effects of sleep on memory and finds that a nap may be the way to go. Read the article here, or the full study here. Having memory trouble? Drop me a note. I'm happy to help point you in the right direction, or discuss my experiences of improving my memory. I've helped people all over the world, via coaching, keynote speeches and corporate workshops, and I'd love to show you that remembering better can be simple and fun. Grab my free ebook about memory improvement, including ten simple ways to remember better, here. In my efforts to continually improve my memory, and support others who are trying to improve theirs, I've tested many different techniques and tools on myself. This is one I'll have to study more: the effects of silence. Many times when I'm training for a memory competition, I have to go to a coffee shop or other busy and noisy location to make sure I'm used to blocking out distractions. For training, daily meditation, or even cooking dinner, though, my preferred background noise is... silence. A new article about a study suggests that silence may help us remember better. There may be a link between silence and stress reduction, and stress reduction and memory. If you're stressed and/or struggling with memory, read the article here. I'm passionate about memory improvement, and use my seminars, keynote speeches, and private coaching to help people discover that remembering better can be fun and easy! Drop me a note with what you're struggling with and I'll help. You can also read my free ebook by clicking here. Researchers at McGill University are looking at what's normal for a middle age brain. Here's an interesting article on their finding, including what midlifers might be focusing on as important information vs. details they don't care about. I've certainly seen this in my personal memory improvement and that of my coaching clients and in my memory improvement keynotes and workshops. Have you noticed that it's much easier to remember what we are interested in? Many people mention to me after my seminars that remembering details at work is relatively easy, it's the home life that's hard. Remember what the spouse or kids say, the names of people we meet socially, or even what to pick up at the grocery store on the way home. That's more than likely us deciding that work is just more important to pay attention to. As we age, we also have more on our minds, and tend to be distracted - which means it's harder to keep track of where we parked the car, put our keys or glasses, or when it's our anniversary. Solutions include journaling, paying more attention where we park the car or put down frequently-misplaced items, and letting go of the desire to multitask. Check out the article if you're "middle aged" or older - it's worth a read. I'm passionate about memory improvement. If you have questions or need help, just send me an email. You can also get my free ebook which has a ton of good memory improvement tips by clicking here. A new study published in Psycho-Oncology discusses the link between exercise and memory improvement in breast cancer survivors. I found it especially interesting because the results seem to be applicable to everyone, whether breast cancer survivor or not. Click here to read the article about the study in Medical News Today, written by Catharine Paddock, PhD. (It's worth the 60 seconds or so if you are at all interested in your own memory improvement). From the article: "They say the findings support their theory that physical activity indirectly influences perceived memory impairment via exercise self-efficacy, distress and fatigue. Moderate-to-vigorous activity includes exercise that challenges you enough to make you breathless and sweaty - for example brisk walking, cycling, jogging, and taking part in exercise classes." Do something to improve your memory today, whether that's reducing your stress level, memorizing a phone number, or exercising! There's a new report out about how making your iPhone display ugly may help you better remember what you see on it: from map directions to your emails. It uses colors to focus your attention. In my experience memorizing a deck of cards in one minute, or an 80-digit number in 55 seconds, color comes in handy. I translate all the cards, or numbers, into predefined images, and combine those into a story to make memorizing something abstract easy. Visualizing Daffy Duck's yellow beak, the white and blue surfboard, and the golden yellow of the lion makes for a strong image. "Colour helps us in memorizing certain information by increasing our attentional level. The role played by colour in enhancing our attention level is undisputable (14,23). The more attention focused on certain stimuli, the more chances of the stimuli to be transferred to a more permanent memory storage (18). As stated earlier, colours have the potential to attract attention." The paper is interesting but pretty dense. Here's an article about the paper that summarizes it well. If you want to try it for yourself, go to: Settings -> General -> Accessibility and select “Invert Colors." If you do this experiment, leave a comment or send me an email with your thoughts! Whether you try this or not, do something every day to exercise your memory. It's easy, fun and it'll help 10 years from now! I found this article interesting. As a memory athlete, I've clearly seen how stress diminishes my ability to memorize and recall at memory competitions. I've seen it in my fellow competitors as well. Those who are better able to manage the stress of a competition tend to do better. As the article discusses, though, anxiety is different. Many of my coaching clients and people at my keynote speeches and workshops tell me about their "horrible memories." After further discussion, though, some reveal other issues that are either contributing to a diminished memory capability or even causing the memory problems. Often I'm able to point them in the right direction so they can finally get to the bottom of what's causing the problem; they can then see remarkable memory improvement. Definitely check out this article if you have memory problems that might be connected to anxiety, stress, lack of sleep, or a racing mind. Still have trouble? Click here to check out my free report which has a bunch of tips for improving memory and figuring out what the issue might be, or just drop me a line and I'll do my best to help. I love discussing memory improvement and telling stories about being a record-breaking memory athlete, so I was very grateful to Zachary Sexton and everyone at Asian Efficiency for interviewing me for their podcast (The Productivity Show). We discussed staying focused, morning routines, memory competitions, memory improvement (even if you think you're hopeless at remembering), how memory works (my "Steps to Memory"), practical tips for improving your memory and more. It's a fun chat. Be sure to listen in, and check out their other podcasts to be inspired and improve efficiency. Click here to listen to the interview, see the show notes and download a variety of tools and information. I recently had the pleasure of being interviewed by Mike Vardy of The Productivityist podcast. What a blast! As someone who is constantly trying to improve and get more done in less time, I had been enjoying this podcast for a while, and was happy when Mike agreed to have me on. Do you have too much to do and not enough time to do it? If so, all of his podcasts are worth listening to. In mine, we talk about how memory improvement can help get more done in less time, and memory improvement in general. Click here to listen, or download from your favorite podcast app or iTunes. Don't miss the show notes - great information there as well! As a keynote and seminar speaker, my goal is to help everyone learn that memory improvement is possible for us all and that it can be both easy and fun. From New York to Los Angeles, Las Vegas to Phoenix, Orlando to Chicago and everyone else in the United States, to any location worldwide, let's talk about changing the lives of your group or team: improving sales, customer service, productivity and the bottom line. I'm featured in a new book! NPR's (National Public Radio) Barbara Bradley Hagerty has written a wonderful new book about middle age called Life Reimagined. A few years ago she interviewed me about remembering better, and I'm in the book. It was amazing to be interviewed by someone I have listened to on the radio so frequently, and I hope that people reading the book will be inspired. I'm still reading it (okay, I read the pages that featured me first! ), but so far it's excellent. Since I'm now of that age, I also find it helpful personally. If you want to buy it on Amazon, you can click here. Need help with your memory? Drop me a note or post a comment here. Whether it's private coaching or a keynote for your group, my presentations are interactive, fun, and life changing. I'm passionate about memory improvement and spreading the message that we can all remember better - and that it's both easy and fun. Re-posted from social media. Want infrequent memory improvement tips? Visit me on Facebook or Twitter! Today's memory improvement exercise is spelling: 'accommodate' is one of the most commonly misspelled words. Usually we know *most* of the word, but get confused with part of it. To remember this one, you need to somehow remember that it's TWO "c"s and TWO "m"s.
Use your imagination to create a picture of accommodating two cats/clowns/cows/cowboys (translate "c" into a picture) *and* two monkeys/men/moms/M&Ms (translate "m" into a picture). Maybe they are moving into your house and you have to accommodate them all? Or you could be going out for dinner with this group and you have to find a restaurant that can accommodate them (translating 'accommodate' into a picture). Make it silly, add some details to the picture or movie in your mind. "But Brad, why bother? That's why someone made spellcheck!" Is that what you're thinking? What about taking care of your mind (exercising it) with even part of the amount of effort you put into keeping your body in shape? What about being creative, having fun, and making a fun game out of self improvement? Picturing two cowboys sitting down to a fancy dinner with two moneys - and you - in a restaurant that accommodates all their pesky dietary restrictions is fun! For those of us getting older sooner than we'd like, memory loss is a real concern. We are more easily distracted and often find it more difficult to get back into a task once we lose focus. At work, we may wonder if we can keep up with our younger colleagues. How can we stay sharp, learn the ins and outs of the new software, apps, and remember all that we're asked to, even as we age? As a motivational speaker and memory athlete, I discuss this all the time at corporate events and for associations, conferences and other business events. I also recently had the opportunity to discuss memory health and some of the above topics on a wonderful podcast called, "2 Boomer Broads Podcast." Rebecca Forstadt-Olkowski and Dr. Sharone Rosen are two delightful people who have a very entertaining podcast. If you're a boomer, it's a must-listen to! If you're not a boomer, I'd still recommend it as they have a ton of fun on every episode as they talk about "Life, Love, Laughs, and Unsolicited Advice!" To listen here, or download, click below (give it a second to load - then it will start playing). You can also find them on iTunes and by searching in your favorite podcast software.. If you know a baby boomer, or someone who needs some general memory improvement advice, please share this.